Facebook Baby Shower for "Loaf"
Like many future first-time grandparents, when our daughter, Danielle, and her husband, Rich, told us they were expecting, I couldn’t wait to host their baby shower. Buying adorable newborn onesies and decorating the nursery were all I could think about. Danielle and Rich also announced they were moving from Seattle to San Francisco and wouldn’t have a permanent place to live until two months before her due date. Our family resides in Texas and Rich’s family is split between Toronto and London. Rich and Danielle have lived all over the world and have friends in Amsterdam, Frankfurt, Singapore, Buenos Aires, most of the United States and the provinces of Canada. I needed a way to host her baby shower so that their friends and especially Rich’s family could actively participate. So began the virtual shower journey. 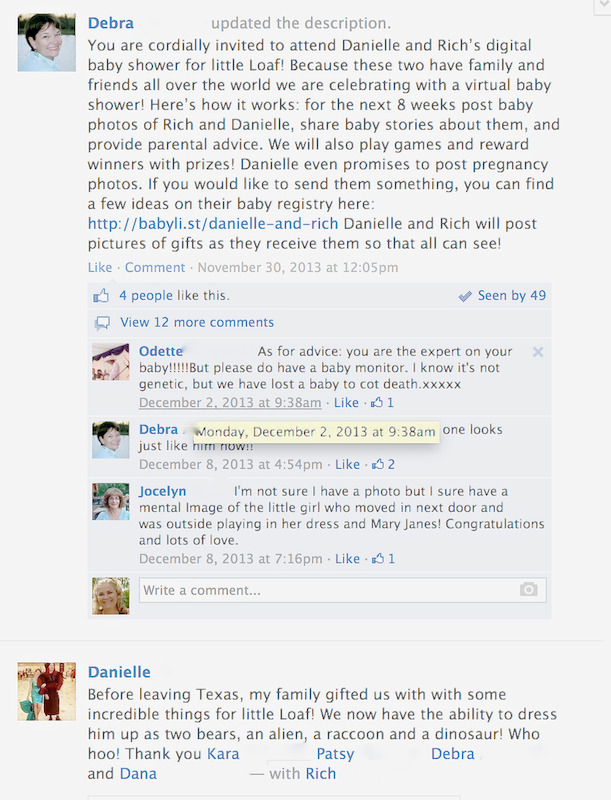 Enjoy the Facebook games, tips, gifts and the engaged people who joined in this unique "baby shower" experience. It was a lot of fun.